WaPo: The obvious economic story is that AI reduces the need for human labor, so the demand for it falls and wages fall in turn. Do you buy that? …People are being put out of work because of automation and we don’t notice it, so we argue about other stuff. We argue that education levels are too low, or that we’re coddling people on unemployment and we just need to cut them loose. These are all old issues that aren’t ultimately about what’s really happening. This is all going to happen slowly enough that we’ll keep arguing until we realize that something new is going on. …the best explanation [for declining employ employment rates since 2000], I think, is that automation is starting to put people out of work, and make the economy more capital and less labor-intensive than it used to be. The challenge for Drum and others, including myself, is that there’s not really much in the way of evidence. Most of the weak employment outcomes with which we’re currently stuck are cyclical. The structural problem of robots and software replacing workers is largely at the level of anecdote. True, the plural of anecdote is data, but we’re not there yet. What about productivity growth and its split with employment growth, as featured here? Yep, I think that’s important and has led me to believe that this question of automation and employment bears close watching. But as Dean Baker likes to point out, productivity growth has slowed in recent years (though not as much as employment). 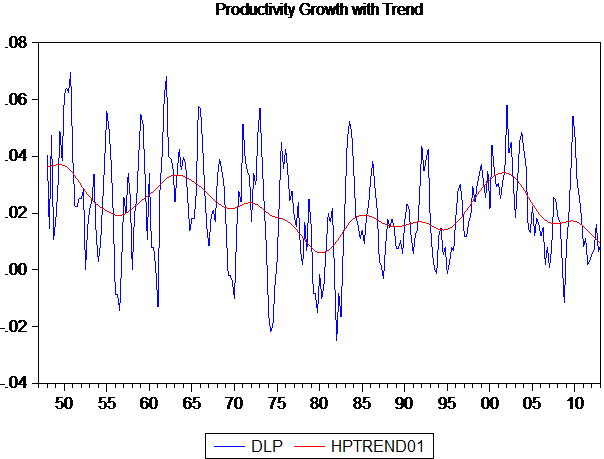 The figure plots annual productivity growth with a HP filtered trend in there to smooth out bips and bops. The post 1995 acceleration is clear, but so is the recent deceleration. This would seem to challenge at least simple linkages between accelerating labor-saving technology (I also looked at total factor productivity, which nets out not just labor inputs but capital inputs as well, so what’s left over represents technological advances in production—it’s jumpy but, if anything, has also slowed of late—see John Fernald’s work on this). Neither is there evidence of much capital deepening in terms of firms’ investments over the period when productivity and employment diverged. As I like to stress, history is littered with Luddite predictions of labor-saving technology displacing workers. Instead, it has typically come to pass that the new technology, while often deeply disruptive, brought its own new labor demands along with it. As Drum stresses, and I agree, there’s reason to believe that this time might be different, but at this point the evidence is largely anecdotal. Share the post "Full Employment Series, #3: More on the Automation/Unemployment Nexis"
9 comments in reply to "Full Employment Series, #3: More on the Automation/Unemployment Nexis"
We actually have multiple problems. Say’s Law (supply creates its own demand) doesn’t work in a recession. It’s failure to work is what causes the recession. If productivity is growing so fast, GDP should be growing much faster. Productivity should be a blessing on its own. But what we really need is T.R.s Trust busting & FDA, FDR’s New Deal, Truman’s GI bill, Eisenhower’s tax rates, Kennedy’s space program, Johnson’s medicare, Nixon’s EPA, a return to core values, nothing radical. Fernald called attention to this and the subsequent decline in the early oughts as well. How much of this is just the impact of Y2K pulling some large investments forward (while delaying projects that could wait until the early 2K’s)? The Drum piece made me wish I was 20 again! We’ll still have the same amount of stuff and all the work gets done by robots! We can just have the robots optimize the allocations and do away with the politics of it all too! In fact, since all of the research that needs to be done will now be completed in record time by robots, we’ll know everything there is to know as well! This is going to even better than “trickle down!” I can hardly wait to tell my kids to forget about all of that homework and get to work on their golf games. I’ve always wondered about the effect of economic concentration on employment. Since the Reagan years the Justice Department has more or less given up on antitrust. Wave after wave of mergers and buyouts have resulted, predictably, in wave after wave of layoffs. Creative destruction smells a lot like trickle down. It seems like concentration might be a significant drag on employment. Is there data? Good question. I don’t know of a systematic study of the aggregate impact of mergers, though you’re right re layoffs (or “efficiency gains” by reducing “redundancies” in the merged firm; M&A-speak). I don’t know the specific mechanics of adjusting for all of the variables, but I’m not convinced that the results aren’t “baked in” to the measurements. I doubt that “assembly line robots” accounted for huge proportion of the gains in productivity. I think its more likely that the “big” gains in productivity were spread throughout the economy in the millions of hours spent acquiring, tracking, summarizing, reporting, and calculating information, all of which is now done at tiny fraction of the cost that it used to be. If you think in terms of the hours spent at millions of manufacturers, wholesalers, and retailers on manually updating and reproducing price books, developing and calculating itemized bids, placing and tracking orders, invoicing shipments, tracking inventories, summarizing sales and cost data, billing customers, etc., etc., I suspect these “productivity improvements” would far outweigh any elimination of human hours by factory robots. Considering the collective magnitude of all of these changes and the collective impact on marginal costs, maybe the question to ask is why wasn’t this accompanied by rather dramatic price deflation? After all, the marginal cost of doing all of these activities by computer is a very tiny fraction of what it used to be and likely very close to 0 for a lot of them. Why didn’t this marginal cost reduction make it into prices? Most likely because a huge amount of it went into rents; specifically software monopolies and manufacturing and trading monopolies. The lack of price competition produced by barriers to entry which were created by the ability (or lack of ability) to implement these changes and achieve the MC reductions (coupled with the abandoning of enforcement of anti-trust laws) allows the oligopolies to capture these rents and prevent prices from falling. If the marginal cost reductions go into rents which then go into “value added,” what’s the effect on “productivity” measures? If you don’t actually measure the rents though and “follow the money” you can probably do a lot of shadow boxing before getting lucky enough to land a punch on one of the ghosts. What was the magnitude of the marginal costs reduction? Where did it end up if not in price reductions? Why are profits up so dramatically in a depressed economy? Why is income inequality accelerating so much over the same time period and even in a depressed economy? How many signals of the same message do we need before actually responding? Lawyers use an interesting term called “negligence” which views failing to act the same as an action. Maybe “representatives” could be impeached for their negligence and failing to act if we could get economists focused on measuring and reporting on the amount and specific locations of rents. If we can measure marginal costs and we can track prices it shouldn’t be all that difficult; after all we do have computers now. I’ve been trying to follow this series, but not had time to comment until today. First off, I think Perplexed’s comment makes some great points. Also, Drum’s point that the economy is becoming more capital and less labor intensive is key. And this is a very important point; I would argue that many companies are creating new forms of (intellectual) capital, but these new forms are not at all well understood by policy makers. To wit: Once upon a time, I worked in a bookstore (part-time, holiday). People needed help; I helped them, but at no point did I keep any records about what they purchased, where it went, what else they read, etc, etc. I was helping build relationships with customers, but I was not creating any database of interactions. Consequently, I was not creating any new forms of capital (apart from ‘social capital’). In addition, the bricks and mortar bookstore did not create any special format on which people might read. They certainly didn’t sell videos. We did simple, straightforward transactions and no permanent records were kept. Move to the late 1990s, the beginnings of eCommerce. I worked in an (online) bookstore, briefly. In that technology, ‘the system’ INFORMATES: it tracks what Customer A buys, where that item(s) goes (by which sort of method: UPS, USPS, etc), gift wrap options, etc, etc, etc. In other words, the online system not only provides a service, it **creates information about the service that it provides. ** I would argue that the ‘informated stuff’, the information tracking millions of transactions, is a new form of capital – specifically, a new kind of intellectual property. It is adaptive; it can target specific customers with special offers in ways that the old bricks and mortar bookstore couldn’t dream of. Think of it as a gigantic, morphing database. As an employee, I had stock shares, so theoretically, I could claim a tiny shard of ‘ownership’ of this new type of capital (a database), which was created by applying algorithms to all of those customer transactions. However, the idea of a labor union, or collective bargaining, was anathema in that environment. The idea that the employees who helped create that vast new database had any any specific ownership rights other than stock options would have been viewed as odd. The thing that increased in value was not the books sold — it was the database of customer transactions. And the ownership rights to that goldmine called a ‘database’ are held by the owners and shareholders, not ‘labor’. Arguably, with each transaction, ‘capital’ becomes far more important than the labor used to create that transaction. Unless you own a lot of stock, you are basically irrelevant as far as the system is concerned. Now add in the idea of an online bookstore that develops its own eReader devices. Unlike the old bricks and mortar bookstore, the ‘informating’ new online bookstore sells books. You read them on your device, and if you want to watch Netflix, well you can view that on your device, as well. The video is streamed from the servers owned and operated by the online bookstore — and yes, they’ll keep ‘data’ about what you watched, when, how long, etc, etc. So by streaming you some video or downloading a book, they are continually ‘growing their database’, so to speak. In other words, they are creating ever more (intellectual) capital. To repeat: it appears that the value of this new form of capital has concentrated in the hands of ‘owners’, and as near as I can tell, this is an iterative process. Ownership (or ‘capital’) has become increasingly more key than ‘labor’, which to me now seems almost antiquated in any setting outside an employee co-operative, or possibly public employees. The concentration of wealth that we’ve seen post-2000 is due in part, IMVHO, to the creation of these vast data goldmines, which grow and morph with every single purchase, query, or transaction in the system. Companies like Amazon, Netflix, Hulu, CafePress, and any other company with customer transactions that occur online are creating huge databases of ‘information about information’. Insurance companies, medical organizations, and a range of other industries are also ‘creating information about information’, and the ownership of this new information is concentrated in the hands of shareholders. This is happening in areas that have nothing to do with books or video; I spoke with a young engineer, who explained to me that the current F1 cars are so packed with sensors streaming data to computers that arguably these cars are primarily data-creators. They informate with every acceleration, turn, and stop. This data is then analyzed and applied to redesigns and tweaks. Finally: In an earlier thread of this series, someone made an interesting comment about the cotton gin. That’s fine, in the context of the 1800s. But to understand things in today’s context, you would have to conceptualize a cotton gin that was recording how much cotton was being produced per hour, what quality, the source of that lot of cotton, the shipping destination, etc, etc. and sending all that data to a database. In other words, you would need to conceptualize a cotton gin that could INFORMATE and create reports and adapt to changing conditions in the cotton markets. As long as economists miss this critical factor about how today’s technologies ‘informate’, they just keep getting bamboozled and advocating policies that don’t address reality. The cotton gin did not informate, and is therefore a poor model for what is going on today. Shoshana Zuboff’s “The Age of the Smart Machine” saw this new development of ‘informating’ back in the 80s. Hanauer’s insights probably come from his real-world experience with Amazon, and I think that is why he’s at the edge of the curve in understanding the impact of complex, adaptive systems and their economic implications. Great analysis, ROTL. Really thought provoking. But how clear is it to you that labor falls out of this equation the way I think you imply? I’m prone to believe that something new and labor-replacing is happening but history is littered with this prediction because folks failed to recognize the new labor demands embedded in the new technology. In your story, that’s everything from big data collectors and analysts to movie production jobs. Thanks for your generous response, and apologies for being so tardy in catching up on this post. I don’t think the economic implications of the emergence of complex, adaptive systems have been well understood by policy makers. I tend to think that new, labor-replacing developments are taking place. You can’t have 30,000,000,000 microprocessors enter the world since the 1980s without fundamentally altering the economy, including jobs. If that is the case, then the need for serious policy shifts becomes even more important. For starters, we spend too little on things that are distinctively human (paying someone to work with young children teaching nursery rhymes, helping seniors with their grocery shopping). The potential for growth in much-needed social services requires better policies — and better accounting, to show the economic benefits of better social services. The ‘human services’ sector could be a potential growth area as other jobs vanish, but that will never happen with the current B-school logic we are saddled with these days. If I am correct and jobs are vanishing, then it certainly makes the research presented in “The Spirit Level” all the more important. Perhaps that epidemiology research can offer some leverage in the policy debates, if in fact we need to create more social service employment, due to the decline of other employment sectors.